Portable push camera system with a 1 Inch diameter tip and a long 100 foot insertion probe. The video camera head is flexible and is supplied with bright LED lighting. Ideal for pipelines, ducts, drains or sewer inspections. 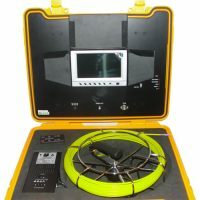 This low cost portable inspection device is designed to deliver quality video inspection in a wide range of applications including: sewers, sewer pipes, air ducts/piping, wells, production piping and power plants. The push camera head contains 12 adjustable LED lights, a flexible spring coiled joint to navigate around corners, and a Sapphire lens to resist scratching. This high resolution pipe inspection camera is designed to capture bright, crisp, color video of the inspection area. An optional 512Hz frequency sonde, located immediately behind the camera head, with the ability to remotely locate it (with the use of the optional locator). The monitor and additional controls are built into a compact, waterproof and lightweight hard plastic case making it easy to transport. The 7” TFT LCD color display presents a live color image with your thumb drive. An adjustable sun hood is included as a sun shield for outdoor inspections. The PVC coated fiberglass cable is waterproof and available in 30 meter (98.4 foot) and 40 meter (131.2') lengths. The reel conveniently stores the cable inside the case and is easy to remove and return to the storage area. This system. 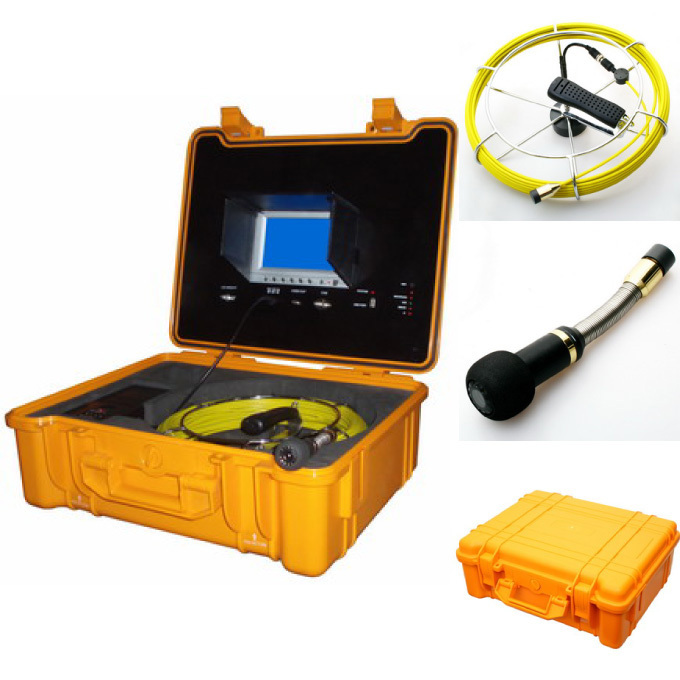 In addition, the control station for this sewer camera can support different diameter probes: 6mm, 12mm and 40mm. 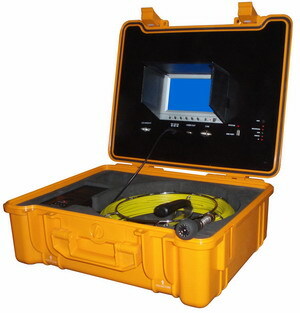 This unit is also available as a pipe inspection camera rental.